Here is a new twist on recycling those plastic produce nets that lettuce comes in at your grocery store. 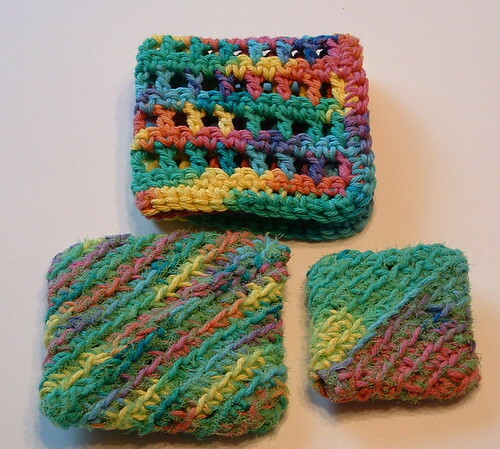 I crocheted using cotton yarn along with the netting to create these handy diagonal scrubbies. You probably have seen the double thick diagonal potholders before. You basically single crochet in the back loops only in the round until the ends begin to curl around and then the sides close in to each other if you continue. Here is an excellent crochet pattern and picture tutorial that shows the method. Ch 14 for a 3 inch scrubbie. I used a J (6 mm) crochet hook and 2 and a half lettuce nets. Ch 19 for a 4 inch scrubbie and about 4 lettuce nets. I used Sugar and Cream in psychedelic cotton yarn to crochet both scrubbies and still had enough left to make this small matching dishcloth using my open mesh magic dishcloth pattern. You assemble the lettuce nets by cutting them about 1 inch wide across to make loops. Here is my picture tutorial on assembling the netting loops so you can crochet with it along with the cotton yarn. You just hold the lettuce netting strand along with the cotton yarn as shown here to crochet the scrubbies. I turned my work to the outside once the edges reached each other which creates the seed stitch look to the scrubbers. Weave closed the seam by using the tail of your cotton yarn to finish off the scrubbie.